Solomennoye (altered for "Salmennoye" from the Karelian "salmi" – "strait") is situated on banks of the strait connected the Onego lake bay along Petrozavodsk to the Logmozero lake. 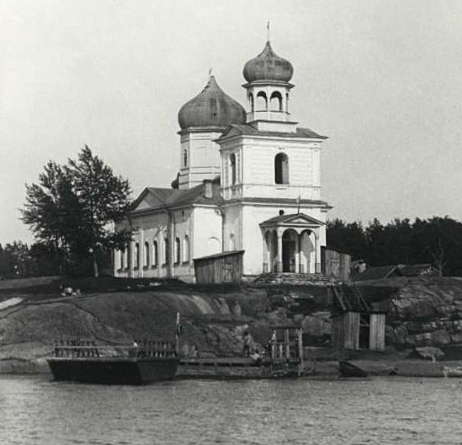 The first records of this local monastery – Salminskaya Pustyn – dates from the XVI century. Today only the stone church built on the huge solid wild rock remains at the south-eastern bank of the strait. In 1781 it was built on money of the merchant Ilya Kononov replacing the wooden one built at the times of the tsar Theodor Ioannovitch. Since 1976 Solomennoye is a district of Petrozavodsk.